Bharradhi Arts conducted Durham LifeBeat, a 24 hour Musical Bandathon in partnership with numerous community partners on September 27 &28th at Pickering High School in Ajax. The Event raised over $40,000. Every dollar raised will go to purchase a new operating room procedure table for cancer surgery at Ajax-Pickering Hospital. Durham Tamil Association made signification contribution to ensure the event was a success. As an Organization, DTA contributed $5,000 towards this effort plus many more DTA members made individual pledges. In addition to supporting Bharadhhi Arts initiative to fight for a cure for cancer, Durham Tamil Association has been an ardent supporter numerous fundraising campaigns organized by the Cancer Society. Mr. Dan Ganesan was a long-term member of Durham Tamil Association. He has been an ardent supporter, advisor, well-wisher and a donor of our Organization. Specifically, he sponsored DTA’s annual University Entrance Scholarship program for many years. More importantly, he was a visionary and a forefather for Tamils living in the Region. He identified the need for Tamils to organize and our drive towards mainstream. Further, he strongly advocated the need for Tamils to build relationships with community partners including federal, provincial and municipal governments in the region. He also understood the plight of Tamil Seniors and worked hard to improve their lives. He was instrumental in the inception of Malvern Tamil Seniors. He was near and dear to us Tamils in the region and we all fondly called him “Ganesan Uncle”. Earlier this year, Ganesan Uncle lost his prolonged battle against cancer and passed away. 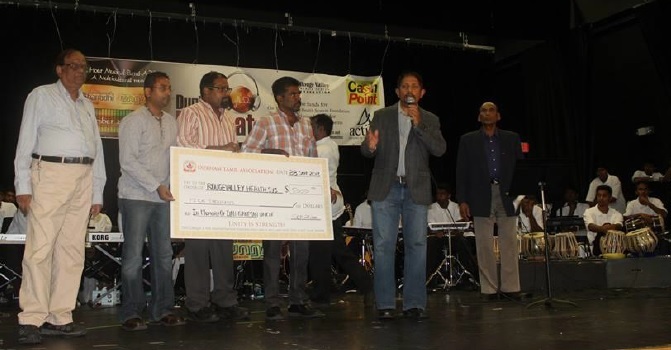 Durham Tamil Association is eternally grateful to Ganesan Uncle and his service to Tamils in the regions and are very proud to dedicate our $5,000 donation in his memory. Mathi Sreenivasan, the director of Bharadhi Arts, accepted the donation on behalf of the hospital. During his speech, he acknowledged Durham Tamil Association was instrumental in bringing their Fundraiser to Durham Region and thanked DTA for our strong commitment despite numerous challenges along the way. Josh Suresh, President of Durham Tamil Association, thanked the performers for their monumental effort and all volunteers for their support. Particularly, Mr. Suresh thanked Mr. Martin Beckett, Director of Education of Durham District School Board, for his strong initial commitment to facilitate the event. Relay for Life is an inspirational, non-competitive, 12-hour overnight fundraising event that brings communities together to celebrate life and fight against cancer. At Relay, people gather with cancer survivors at the sports field and take turns walking laps all night. People stay overnight in the decorated tent to enjoy music, food, activities, entertainment and to celebrate life. Relay participants make a commitment to raise at least $100 and are supported with the tools to reach their goals. DTA played a vital role in this event as we had many youth volunteers partaking in this occasion, both on May 31st and June 1st .The volunteers actively involved in major works like clean up, providing information to the guests and also participated in the fundraising event. DTA creates volunteering opportunities not only to expand their network, but also enable them to enhance their communication skills. Durham Tamil Association was invited to volunteer and participate in this noble cause event Sail-A-Bration which was organized to the selfless brave Ajax Girls who helped the country by making bombs during World War 2. DTA's 29 youth volunteers contributed their presence in Oshawa on both the days actively. The youth played a major role in setting up the booth, organized games for children, guiding the incoming traffic, also helping the entire guest with the parking, providing a detailed tour to all guests who approached them with queries. DTA youth also applied Henna tattoos to guest and raised money for the Ajax Bomb Girls Legacy Campaign. Thanks to Town of Ajax for this great opportunity to our youth. The Audley Recreation Centre, a new community hub is a place where all Ajax residents can come together to learn, work, and play. The grand opening was arranged in a very luxurious manner on Saturday June 8 th from 1 pm till 4 pm to all residents of Ajax , bringing interest to all age groups. The day were filled with live entertainment, Celebration cake , skateboard competition, cultural performances, games and activities, buskers and so much more! Durham Tamil Association had a booth set up to grant service for the public who came for the opening function with various activities like Temporary Tattoos for kids, Henna, Rice Art which is an ancient art. The youth volunteers of DTA came in large number to this occasion. They decorated the booth with kuthuvilaku and other symbols of Tamil culture which made other nationalities to take a picture of our stand. The guest were fascinated by the Henna and Rice Art. Entire guests who visited our booth were happy and returned with a cheer on their face. We were honored to see Mr. Chris Alexander visiting our booth and he was pleased to see the good works of Durham Tamil Association and said we are all over the place promoting the social services to human kind of all walks of life. The astonishing 43rd Ajax Home Week celebration by MPP Joe Dickson swept away thousands of hearts during the massive and colorful parade that took place on 14 th June in Durham Centre. The main goal of the Ajax Home Week is to say thank you to the wonderful people of Ajax including all business and commercial community who have supported the non profit organisations and service club throughout the year. Durham Tamil Association proudly took part in Ajax Home Week celebrations and particularly the fascinating parade. DTA's four member PINNACLE BAND launched their musical extravaganza during the parade and took the crowd with them. Also, Sarika Navanathan mesmerized the audience with her sweet voice. DTA overwhelmed the crowd by the luxurious Limousine with members dressed in colorful traditional outfits bringing lots of cheers to the loving people of Ajax who were witnessing this historical parade. happy and cheerful. Tamara appreciated DTA’s kind service and wanted us to work with them all year around as she felt she could rely on us. All this hard work from our youth volunteers have gave them a real sense of pride for helping to improve the lives of people affected by cancer.